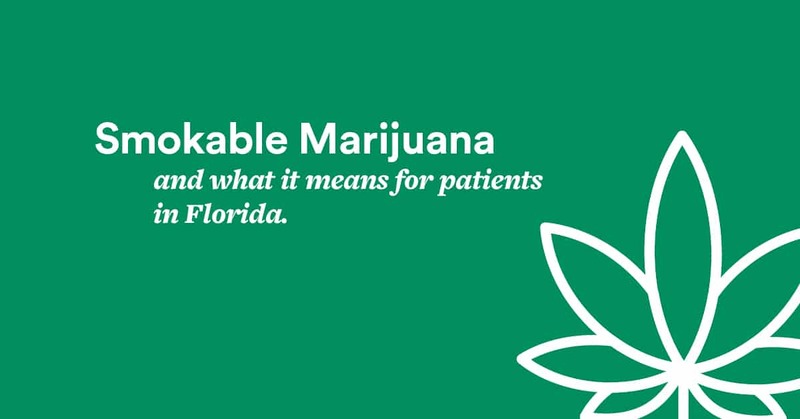 As recently as 2016, patients who live in Florida (and suffer from a qualifying condition) have had the option to see if they qualify for medical marijuana to help alleviate symptoms they may be experiencing due their condition. While there are a number of medical marijuana products to choose from across the dispensaries in Florida, you won’t find any form of cannabis that can be inhaled through rapid heating and burning (i.e. smoking). More recently, however, incoming Governor Ron DeSantis has made efforts to quell some of the measures taken by former Governor Rick Scott’s administration to keep the smoking ban on medical cannabis up and running. This could potentially mean great changes ahead for medical marijuana doctors in Tampa. What medical marijuana products are currently legal in Florida? While the selection of medical marijuana products in Florida may be restricted at the moment, that doesn’t mean there aren’t a number of treatment options for patients who suffer from qualifying conditions. Florida’s medical marijuana dispensaries have consultants on hand who can assist patients in selecting products within the limits of a doctor’s recommendation. This helps the patient more quickly and easily narrow down the best product in treating their symptoms. Currently, Florida dispensaries offer a wide array of both psychoactive and non-psychoactive medical marijuana products, ranging from THC to CBD to CBN, as well as products that may contain a combination of these compounds. However, the only delivery systems that fall under legal use are: vapes, vaporizer machines, tinctures, capsules, oil cartridges, and topical creams. A lift of the smoking ban could spell some potential benefits to medical marijuana doctors in Florida, and their patients. What benefits are coming for patients? While there has been no official ruling yet, should the smoking ban be lifted on medical marijuana use in Florida, patients could potentially benefit from a wider selection of medical marijuana products and delivery methods. Therapeutic marijuana use may respond differently from one patient to the next. Each person’s cannabinoid system can respond differently to a variety of strains and delivery methods making medical marijuana an imperfect science, so to speak. While the science behind it may be imperfect, the benefits to the patient are ostensibly real. Likewise, the patient may stand to gain a great deal of benefit with the addition of a number of new medical marijuana products. With more options comes a greater chance that the patient can zero in on what medical marijuana products work best for them in treating their symptoms, while reducing any unwanted side effects. The changes coming with the potential lift of the smoking ban in Florida will not be limited only to patients, however. There may also be noticeable changes on the horizon for medical marijuana doctors and dispensaries in Tampa. What does this mean for medical marijuana doctors in Tampa? Governor Ron DeSantis has openly criticized Florida Legislature’s medical marijuana laws, more specifically, the smoking ban. He has stated that he wants a new law in place by mid-March that will end the ban on medical cannabis products that are intended to be inhaled through smoking. This new legislature will also temper the limits on treatment center licenses, making licensure less restrictive and truly opening up a great deal of treatment options for medical marijuana doctors (and their patients) in Tampa. The changes could benefit medical marijuana dispensaries in Florida as well by further diversifying the selection of medical cannabis products they can offer. With all things considered, a greater selection could potentially lead to increased revenue for those licensed dispensaries who sell medical marijuana products.